When in transit the horses are provided with hay and water. It’s best for the horse not to be fed too much prior to the trip to prevent colic. If the horse is on a certain diet, the customer can bring the feed and the instructions. The same goes for medication that can be mixed with the food. When handed over to the driver with detailed instructions on paper, this can be administered in transit. 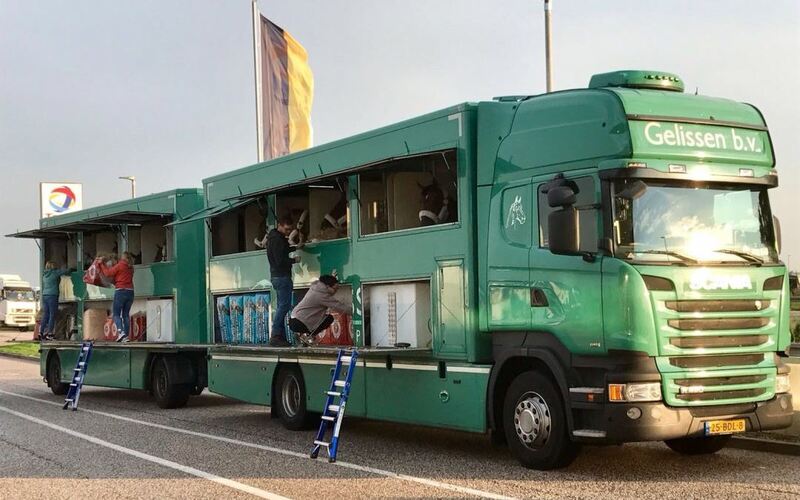 The drivers take turns driving every 4 to 4.5 hours and take care of the horses during the break. The shared loads especially are on a tight schedule. Our aim is to keep the transit time for the horses as short as possible. Our horseboxes are all equipped with cameras, so the horses can be monitored along the way. On longer trajectories the horses are stabled in the evening. Over the years we have built ourselves a network of yards we can use in transit in countries such as Italy, Spain and France.